Panama or the Republic of Panama is located on the southern end of the Isthmus of Central America, bordered to the north by Costa Rica and to the south by Colombia. To the west you will find the Pacific Ocean and to the east the Caribbean Sea. Panama lies in the Northern Hemisphere as well in the Western Hemisphere with the capital of Panama being at 8°58’N, 79° 32’W. The mountains of Panama extend from the north with the border of Costa Rica to the south to the border with Colombia. The range of mountains is volcanic and heavily forested. The highest point is Volcan Baru at 11401 feet (3475 meters). The Pacific coast area has white sandy beaches that merge into rolling hills as they proceed inland to the higher mountain ranges. Along the southern portion of Panama and the Pacific Ocean, one will find few people, thick rain forests and swampy low lands that climb to high mountain peaks along the Colombian Border. Along the southern Pacific Coastline one will find numerous islands that include Taboga Island/Isla Taboga, Cebaco,Coiba and Pearl Islands. Along the northern Caribbean Sea one will find a region of hundreds of small islands that make up the Bocas Del Toro and San Blas Archipelagos. Panama is made up of 9 provincias and 1 territory. Bocas del Toro, Chiriqui, Colce, Darien, Herra, Los Santos, Panama Province, San Blas and Veraguas. Panama is almost cut in two by the Panama Canal. From the Caribbean port city of Colon, the canal winds its way across 48 miles of the Isthmus of Panama passing through 17 manmade lakes, Gatun Lake and 3 Locks with the Miraflores lock being the most famous. The Panama Canal ends on the Pacific side as it passes under the Bridge of the Americas and enters the Gulf of Panama. The Panama Canal was built by the U.S Army Corp of Engineers starting in 1904 and being finished in 1914. In 1977, Jimmy Carter, President of the United States and Omar Torrijos President of Panama signed the Torrijos-Carter Treaties of handing the Panama Canal back to the Panamanians on December 31 1999. Today Panama has a population of just over 3.2 million people. The primary language is Spanish and English as the secondary language. 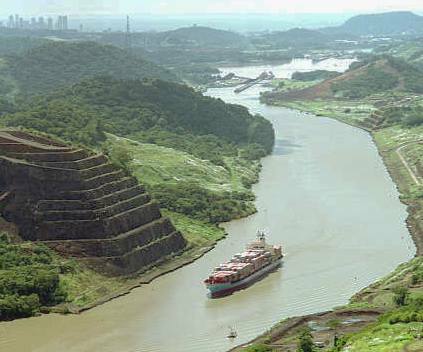 The Panama Canal is supported by three main ports in the cities of Colon, Cristobal and Balboa along the Caribbean and Pacific side of the isthmus. The climate of Panama is very Tropical, warm, cloudy and humid with very little weather changes throughout the year, temperatures range from a low in the 70’s to the high 80’s in the afternoons. The long rainy season will run from about May to January with the dry season from January to May. The port city of Colon on the Caribbean Sea will receive in the neighborhood of 120 inches of rain while Panama City on the Pacific side will get about 75 inches during the year.